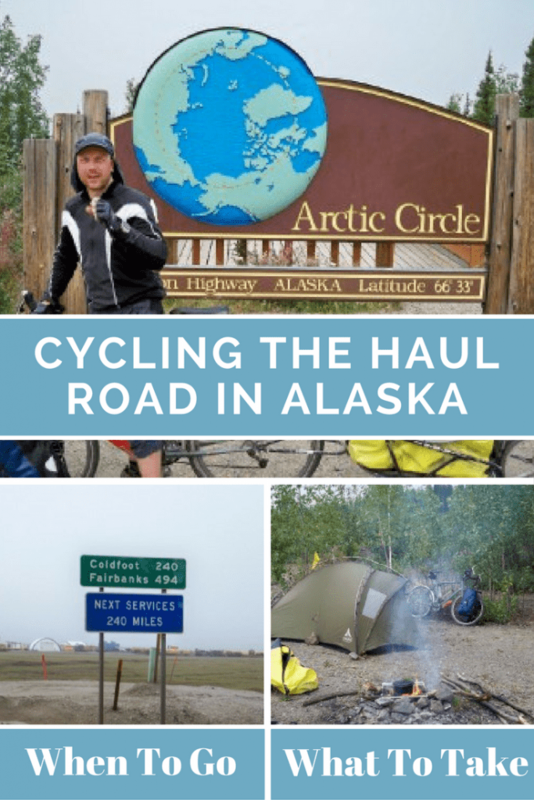 Cycling the Haul Road in Alaska is quite a challenge, and the information is scarce. So I thought I would pull some of my old blog posts together in order to create something that other cyclists might find useful. The start of my cycling trip from Alaska to Argentina really through me in at the deep end! I began up in the arctic circle, on the very edge of civilisation itself. Only one road leads to and from here – The Haul Road. The Haul Road is also known as the Dalton Highway. It connects Deadhorse in Prudhoe Bay, Alaska with Fairbanks in Alaska. It is renowned for its long stretches of steep inclines, and unsealed surfaces that can turn to thick mud. Strong winds are also an issue. Cycling the Haul Road in Alaska is challenging on a number of levels! 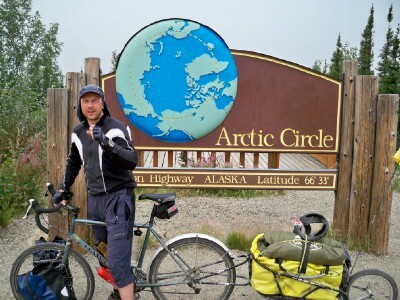 Which Direction Should I cycle the Dalton Highway? There are two directions of travel that you can choose from when cycling the Haul Road in Alaska. These are to cycle from the North to South, or from the South to North. Each one has it's pros and cons. I decided to cycle from North to South. If I were to do it again, I would probably choose the other direction. The reason for this, is that I caught a tourist bus ride to Deadhorse up to the north which wasn't exactly cheap and cycled down from there. Going the other way, on arrival in Deadhorse, it is common practise to hang around and see if it's possible to get a free ride back on a truck. This normally takes a couple of days. I haven't heard of anyone cycling in both directions, I suppose there must be at least one crazy cyclist that has done just that! The Dalton Highway is in the extreme north of Alaska. This means there is only a relatively small window of time that cycling is possible to avoid the snows. As already mentioned, I started in July. The most common months to cycle the Haul Road are July through to September. Even during this time, there might be snow given the weathers unpredictable nature. Outside of that time frame, the snow might hinder even the bravest adventure cyclist. Although I haven't heard of any, I suppose at least one person has cycled in the winter! Interesting note – Cycling the Haul Road will mean that you will experience almost 24 hours of sunlight. It took me 8 days to cycle the Haul Road. This was longer than I anticipated due to injuring my knee. I would say that 6 days would be about average for most cyclists. Plan what food to take very well!! This is a remote stretch of road, and its not like there are stores on every bend! You might be interested in this article on what food to take on a bicycle tour. Make sure you have enough fuel for your camp stove, and take some extra supplies just in case the route takes longer than you thought. There are bears up in Alaska, so taking some bear spray is recommended, although in my experience, I was in far more danger of the mosquitoes! Bug spray and plenty of it is the order of the day, and a head net is not a bad idea either. Other blog posts that may interest you are shown below. Fan maps looks quite interesting and like a great resource! Great write up on a what sounds like a great trip. I am looking forward to riding this route for myself and love to read through a journal to fuel the fire and prepare. I will certainly add a link to your site from mine.